Kenjutsu is the study of the martial application of the Japanese sword. 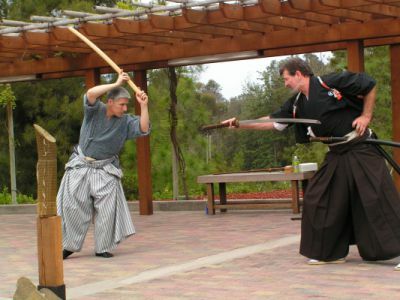 The study of kenjutsu is very different from modern sword arts such as kendo and iaido. 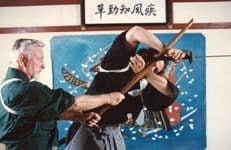 In a classical bugei (military training system) the sword and the unarmed arts are identical in principle and technique. Knowledge of the sword is essential to understanding the unarmed arts of the Samurai. Study of the sword brings a depth of comprehension that allows true insight into the Samurai mind. Once a student is fully accepted into the dojo and has learned the kihon waza (required techniques), they may be permitted to begin sword training. The sword also defines the morality of the Samurai code of bushido. For the Samurai the proper use of the sword was to defend the innocent and the country against evil. An old samurai saying, “kastujinken satsujinken”, carries the meaning, “The sword that cuts down evil is the sword that gives life”. Having the ability to protect the innocent from evil is the goal of the study of kenjutsu. In essence (as should be the case in all martial arts study) the pursuit of kenjutsu made the samurai warrior a more competent and responsible citizen. This is as true for modern practitioners as it was for warriors in ancient times. Iaijutsu is the rapid deployment of the sword with combative intent. It is a separate area of study with it’s own distinct waza (curriculum). The ability to rapidly and fluidly draw the sword and successfully engage an enemy was crucial to the samurai both in attack and defense. The techniques for accomplishing this feat are sophisticated and take serious instruction and practice before they can be done safely at speed. At the Dojo of the West Wind sword arts are done with wooden practice swords as well as live (real and sharp) swords once a student is ready. The fact that our students use a real weapon facilitates both speed and a depth of learning that would not exist if live blades were not used. Subtle physical movements and mental awareness become second nature to a swordsman. At the higher levels of skill, the opponent is controlled with the swordsman’s will and is unable to attack without being cut down in the process. Aiki-jujutsu is a legacy of Japan’s feudal era. This art was developed through generations of intense personal conflict and warfare. The softness in application of technique evolved because it was the most efficient manner in which the Samurai warrior could defeat his enemy. This art has been distilled from the most absolute of human physical conflict – close hand to hand combat with edged weapons – specifically the samurai sword and knife. Aiki-jujutsu is a hidden or “inner” art in that it is not possible to see what is really making the technique work. As with the strategy of the sword, the main goal is to hide one’s intentions and actions. The basic tenet of Aiki-jujutsu is to never oppose force with force, but to direct and utilize the power of the attack to overthrow the enemy with his own strength. Eventually, with knowledge and training, it becomes possible for the mind to freely lead the body and sword into action with creative spontaneity.